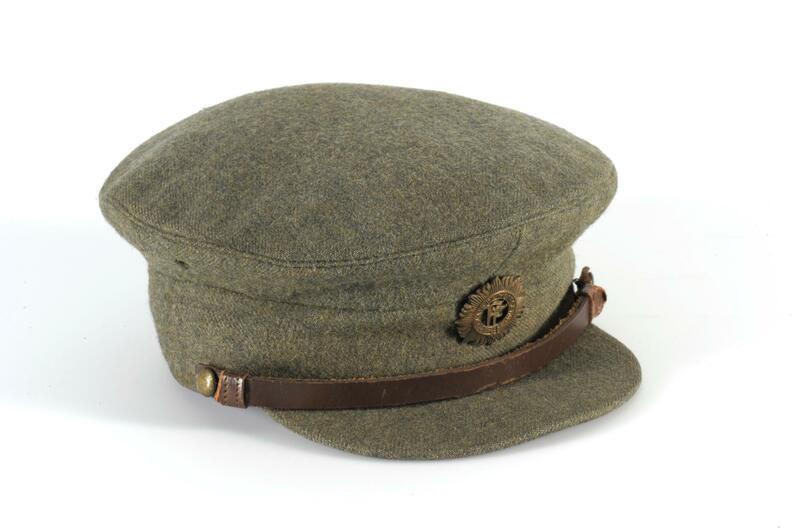 Irish Defence Forces Cap. Green cloth, leather chin strap with plain brass buttons. Brass "sunburst" badge. Leather sweat band, lining torn out. Oglaigh na h-Eireann (Young Ireland). The Badge design is derived from the badge of the Irish Volunteers and was designed by Professor Eoin MacNeill, Chairman of the National Executive of the Irish Volunteers. This badge was originally adopted by the Irish Volunteers in October 1914 as the official badge of the organisation. The Centrepiece is formed of the letters ‘FF’. These letters signify ‘Fianna Fáil’.